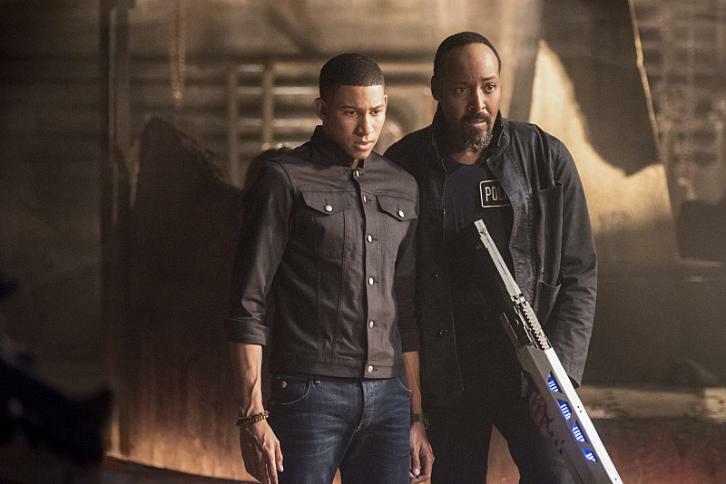 In the most recent episode of The Flash, “Shade,” there is much ado about truthiness. There is also some Joe West flirtation, angst, Alchemy falling for a pretty obvious trap, and Julian Albert being standoffishly British/possibly an evil mastermind. A metahuman called Shade plays a minor role, despite getting the title of the episode named after him. Caitlin is afraid and grumpy. Wally is just grumpy. Iris punches her brother in the face. H.R. Wells is still a Manic Pixie Dream Wells. I have so many questions and so few answers and I’m just trying my best, people. Aw, this week we get a beginning voiceover from Wally as alternate-timeline The Flash! Or Kid Flash? Whatever, he’s adorable and excited about helping people, although Joe is dubious about the goodness of Wally’s impending metahumanity. I have to be honest: I don’t really get why everyone in this episode is so worried about Wally getting speedster powers. Yeah, he gets badly hurt (dies?) in the Flashpoint timeline, but the cause of his death was The Rival — who is, himself, quite dead now. There’s very little to indicate that Wally would be in any more danger fighting crime than Barry or Jesse. It’s bizarre how they all seem to associate Wally getting his powers with his impending doom, as if one is a prophetic indication of the other. Speaking of prophetic indicators: Caitlin is still afraid of her growing Killer Frost powers and is still keeping them a secret from the rest of the team. She steals a pair of power-dampening cuffs from Cisco and I think we’re going to be in for a whole episode of Caitlin being shady (ha!) but she actually confesses pretty quickly when Cisco starts blaming H.R. for the thievery. What’s more: Caitlin tells Cisco about her powers (hooray!) in order to ask him to use his Vibe abilities to see the future. She says that if he sees her acting all evil, she’ll run away. I have a lot of issues with that plan — the most prominent being, as Cisco says later and I’ve been saying for ages, why Caitlin would think it a good idea to run from actual metahuman experts/her best friends — but that’s what Caitlin thinks she has to do to keep the people she cares about safe. Cisco vibes the future of Caitlin Snow and sees her, as Killer Frost, fighting him as Vibe. Assuming that Caitlin is evil in this vision, he lies to her (boo!) and tells her there’s nothing wrong. Hey, Cisco, how do you know that Killer Frost is the evil one in your power-induced premonition? Are we conveniently forgetting about the Evil Cisco that used to hang out with her? Heck, Earth-2 Cisco was arguably more evil than Killer Frost was, since Reverb definitely wanted to rule the world — Killer Frost just wanted to survive. Don’t get all judgey from that vision, sir. I suppose this episode is all about facing truths, because in “Shade” the truth eventually comes to light (double ha!) for everything and everyone: not only Caitlin’s powers (which get revealed to Cisco and then, via Cisco, to everyone else) but also Cisco’s duplicity regarding his Vibe vision, and Wally’s family facing the idea that he’ll probably be getting speedster powers, and Wally himself learning the truth of his Flashpoint life. Truth, truth, truth for everyone! But beyond truth, there is plot: namely, the episode-centric plot of a shadowy metahuman attacking people, the season plot involving Alchemy and his looming threat over Wally, and Caitlin’s future villainy. We touched briefly on the last thing, we’ll focus on the middle bit later, and allow me to further summarize the first plot element on the list — oh wait, that is literally all there is to it. A metahuman with shadow powers is attacking people. Team Flash kind of wants to stop him but really seem to have more important things to deal with. They stop him at the end of the episode, the end. Maybe all the truth going on this week is supposed to be an ironic reference to the episode’s title, because the title certainly not proportional to the importance of the villain it’s named after. I don’t think I’ve ever seen an episode of The Flash in which the metahuman of the week was so utterly insignificant. Alchemy completely overshadows (triple ha! Pun hat trick!) Shade in every way and his existence doesn’t even lend itself to the character or plot development in other areas of the episode. Sure, we see the cuffs get used on him — but the team using those cuffs on Shade is more of an afterthought to Caitlin using them on herself, and the threat of Shade wasn’t exactly pivotal to anything the team does or learns. Now that the Shade story is out of the way, let’s focus on the really important villain: Alchemy. As I mentioned earlier, Alchemy has been sending Wally West dreams of being a speedster named Kid Flash and everyone is worried that this means Wally has been targeted to receive the speedster powers he had during the Flashpoint timeline. This is a problem, for some reason, and Team Flash devises a plan to stop Alchemy from getting to Wally while Wally angsts about his friends and family keeping him from getting the superpowers that would allow him to help people. And run really fast. Don’t forget Wally’s addiction to speed (the rapidity of movement, not the drugs). Alchemy keeps talking inside Wally’s head and causing him a lot of pain, but everyone on the team is adamant about not letting him do what Alchemy wants. They get the bright idea to lock Wally up, with just his sympathetic sister and a camera to watch over him, and everyone reflects on how cool superpowers are. Or dangerous. Whichever one. Caitlin is still worried about what her Killer Frost powers might do to her morality, Iris is kinda bummed out because she’s the only one of the group besides her father (and now H.R.) who has no super intelligence or superpowers, and she explains how Wally wanting speedster powers is motivated by a little bit of altruistic envy. Wally inevitably convinces Iris to let him out of the tunnel but, because Iris is awesome, he doesn’t get very far before she punches him in the face and knocks him out cold. Oh, Iris. You prove every episode that you don’t need powers or a genius level IQ in order to be amazing. You are amazing automatically, and even more amazing for what you can manage as an “ordinary” person. Iris West is terrific. Once Wally is back under control, it becomes very clear that the psychic pain Alchemy is causing him will hurt him far more than the theoretical death that could come from Wally gaining powers. Thus, the genius plan: pretend that Wally is going to Alchemy, follow him, and then apprehend Alchemy. At first I don’t think it’s going to work — how stupid would Alchemy have to be to fall for it? — but then it does! And Barry ruins it by gloating at him. Come on, Barry! What have I told you about gloating at villains? I swear, it’s like you don’t even read these reviews. Thanks to Barry’s gloating, we don’t get to see who Alchemy actually is (I suspect the suspiciously absent Julian) before a zippy white light rumbles its way into the room, snapping up police officers and offering Alchemy a chance to escape. Barry urges Joe and Wally to run while he goes after the white light and Joe listens, but Wally is captivated by the glowing stone Alchemy carries around. He touches it and disappears into a... tree? And then a monster calling itself Savitar, the God of Speed pins Barry to the roof. I don’t think the God of Speed is too happy with Barry. Understandable, though. No one is happy with Barry this season. Every time Barry talks to Julian he acts like he’s asking him out on a date. “There’s only one problem with that. It’s your face.” Cisco isn’t so much about the tact, when it comes to H.R. “Who cares what Barry’s saying?” Someone needs to say that line at least once and episode. Julian actually says “Cheerio.” He’s reached Maximum English. “I haven’t met anyone yet; it’s gonna take a while, even when I do meet them, to get to the cuffs stage.” H.R., for real. How do Earth-19 snack machines work if their coins are triangles? H.R. flirting with Joe’s date RIGHT IN FRONT OF JOE, though. Dial it back, buddy. Alchemy calling Wally “Wallace” all the time is really amusing. Because I was curious, I looked up Savitar and found out that the character in the comics named himself after Savitr, the Hindu “god of motion” — except then I looked up Savitr and found out that he’s not so much the god of “motion” as he is the god of moving things. Like, the god of instigation. I don’t know, I just find that mistranslation/misconception amusing. Savitar basically named himself a MacGuffin. Anyway, this has been today’s Pointless Trivia with Deb. Please carry on.